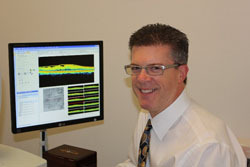 Comprehensive eye exams are essential to maintaining good eye health. In addition to correcting vision problems, a routine exam can detect many eye diseases, such as glaucoma, before any symptoms are present. 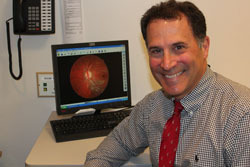 Early detection is key to treating such diseases and preventing any vision loss. Many people get eye exams because they are experiencing difficulty with their vision. The most common vision problems include myopia (nearsightedness), hyperopia (farsightedness), astigmatism, and presbyopia. Myopia affects about 25% of the population and results in the ability to see clearly up-close, but not at a distance. Hyperopia has the opposite effect, affecting the ability to clearly see near objects. Astigmatism is an irregular curvature of the cornea that makes it difficult for the eye to focus clearly at any distance. This condition can occur in conjunction with nearsightedness or farsightedness. Presbyopia affects older people due to the natural loss of flexibility of the lens as we age. Individuals with this condition can no longer focus up-close and need glasses for activities such as reading or using the computer. At your routine exam, the doctor will assess the overall health and function of your eyes. The sharpness of your vision will be checked with visual acuity tests. 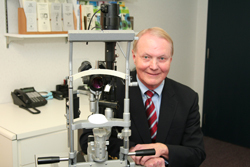 A pressure test checks for glaucoma. The doctor may dilate your eyes using drops to get a better view of the internal structures of your eye. If you have been dilated, you should not expose your eyes to bright light for a few hours after the exam until the effects of the drops wear off. If you are under 40 and have no known eye conditions or diseases, you should have your eyes checked about every two years; if you are over 40, every year is strongly recommended. If any other conditions are detected during the exam, the doctor will recommend the appropriate treatment or refer you to a specialist.